Hosting an event can be very stressful—especially if you spend a	lot of time worrying about food. Getting your friends and colleagues together	should be fun; instead of painstakingly planning a menu and preparing	elaborate dishes, consider letting the team at	Pizza Chicago take care of the menu. We love to cater all sorts of events throughout	Palo Alto, and our deep-dish Chicago-style pizzas are popular with everyone. Pizza is an excellent food choice for virtually all occasions. Here are	just a few events for which you might consider hiring our pizza catering services. Graduations: Celebrating a high school or college graduation is a wonderful excuse to	gather a group of friends and chow down on tasty Chicago-style pizza. From elementary school graduates to Stanford graduates, we’re happy	to supply pizza to anyone who wants it. Work Functions: After weeks or months of hard work, it can nice to reward your employees	with a casual pizza party. Pizza is unpretentious and affordable, making	it the perfect food for low-key work gatherings. Holiday Parties: The great thing about pizza is that it’s delicious all year round! If you’re looking for a quick and easy food choice for your next holiday	party, consider serving pizza alongside your holiday favorites. Catering for any number of people can be a tricky affair. 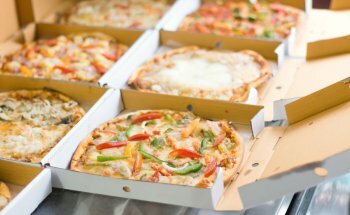 Though pizza	can simplify your plans significantly, there are still a few considerations	you’ll need to make. Number of Anticipated Guests: Knowing the approximate number of guests will help you determine how many	pizzas you need to order. If that number is unclear, it’s best to	err on the side of too many pizzas. You certainly don’t want hungry	guests, and there’s nothing wrong with extra pizza! Dietary Restrictions and Preferences: Consider asking people about their dietary restrictions and preferences	when inviting them to your event. If you aren’t sure, Chicago Pizza	will gladly make something for everyone—including your gluten-free guests. Punctual Delivery: For your event to go as planned, everything must work in harmony. If you	rely on us for your catering needs, you can be sure that your pizzas will	arrive on time and ready to consume. Don’t strain yourself planning your next event—call	Pizza Chicago at (650) 424-9400 for pizza catering near Palo Alto. We’re also happy	to provide our Palo Alto neighbors with simple pizza delivery—which	is catering on a much smaller scale, you might say.